State Highway 1 between Picton (south of Blenheim) to Kaikoura and Christchurch is now available 24 Hours per day 7 days a week. Road access on State Highway 1 from Christchurch (Cheviot) to Kaikoura is available 24 hours per day 7 days a week. New Zealand because of its size, is an easy country to travel around by car. A few hours drive will take you city to city on either island and there are many small towns and points of scenic or historic interest in between. Visitors are often surprised to find that they can travel from the east coast to the west coast in a matter of only a few hours. Of course how much you see of the country will depend on how much time you have available and what your interests are. Good quality accommodation is readily available and it's a good idea to get off the beaten track and meet the locals and check out New Zealand's unique scenic beauty. 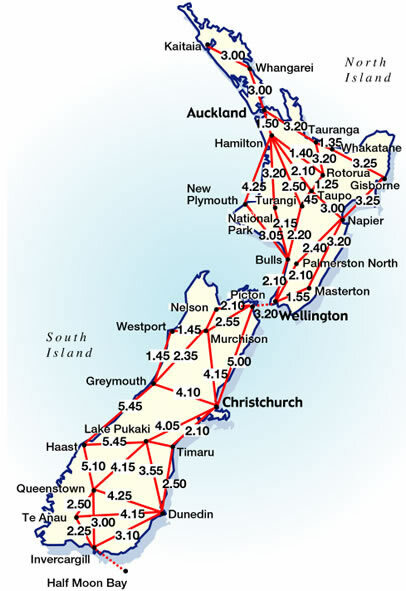 There is no national network of multi-lane motorways/highways or freeways in New Zealand, except for high density population areas around Auckland, Hamilton, Wellington and Christchurch, so travel is on standard 2 lane highways where the speed limit is 100 km/h (Kilometres per Hour) and is rigidly enforced by New Zealand Police. If you're accustomed to driving in Europe, Asia, India, South America, Canada, USA or from other countries where traffic drives on the right hand side of the road, you need to be particularly careful to stay on the left side of the road when driving in New Zealand. - When driving in New Zealand, allow for 5-6 hours of driving per day. This allows you to have driving breaks on the way and plenty of time for sightseeing. - If you arriving into Auckland, Christchurch, Wellington or Queenstown on an international flight from a country where you are use to driving on the right hand side of the road, please do not try any long distance driving. Stay in your arrival city or location for a least for 24 to 48 hours, so you become familiar with New Zealand driving and road conditions, before starting any long distance driving. - 55% of New Zealand has hills and mountains, so speed limits will reduce to 50 to 60 km/h for hilly or mountain regions, so when planning your New Zealand driving, work on the the mean average on 80 km/h when travelling between destinations. - The map on the left gives you approximate (not actual) driving times between destinations. With the advent of mobile devices map apps (applications) like Google Maps, driving times and/or suggestions are not accurate, as in most cases that the time and distance given by this map apps are based on the the shortest distance between destinations and not the actual driving time and/or distance between those destinations nor reflect traffic, terrain and weather conditions. Most rental car and campervan/motorhome operators, offer one way rentals, allowing you to travel the full length of the country or if you prefer, you can drive down one coast and back up the other and leave from the same airport you arrived at. There are regular ferry services from	Wellington to Picton or vice versa providing roll on/roll off passenger, car, campervan and freight services. Travelling by ferry across Cook Straight gives you the opportunity to see the beautiful Marlborough Sounds and Picton. Cook Strait ferries take about 3.5 hours to cross Cook Strait between Wellington in the North Island and Picton to South Island. If travelling by rental car, you leave your car at the ferry terminal and collect another car at the other side. When you check in, your bags are taken care of and you're free to relax on the ferry and enjoy the views. If you are picking a rental car in Picton, you will need to have a reservation on a Cook Strait ferry service in advance, as most rental car operates in Picton will have vehicles available for prebooked hires only due to the isolated nature of Picton. If you are dropping off in Wellington and picking in Picton or dropping off in Picton and picking up in Wellington, it is strongly recommended that you have a confirm reservation on an Interislander or Bluebridge ferry, so you can advise your rental car operator of your reservation when you first pick up your rental car. It is strongly recommended that you prebooked your Interislander or Bluebridge ferry sailing in advance, especially during public holidays and between December to March. The are no ferry services that carry cars or campervans/motorhomes between the South and Stewart Islands. These ferry services are for passengers only. If you want to travel on the TranzAlpine train from Christchurch to Greymouth, you will need to drop off your rental car the night before your travel date on The TranzAlpine train and pick up your new rental car in Greymouth. If you pick up your new rental car within 24 hours of the drop off, there will be part of the rental rate that your have booked for. If you pick up your rental car in excess of 24 hours, this will deemed to be a new hire and you might have to pay different rate compared to the original rate as originally booked. If you are picking a rental car in Greymouth, you will need to have a reservation in advance, as most rental car operates in Greymouth will have vehicles available for prebooked hires only due to the isolated nature of the West Coast of the South Island. Please make sure that you rent a car more than 4 days if using a 1 tier rental car company or 7 days is using a 2 tier rental car company, if picking up in Greymouth or you will pay a 'Pick Up Fee' of NZ$75 to NZ$150.00 (depending on rental car operator used) if hire is less than 4 or 7 days. This also applies if dropping off in Greymouth and if the hire is less than 4 or 7 days. If you are dropping off in Christchurch and picking in Greymouth or dropping off in Greymouth and picking up in Christchurch, it is strongly recommended that you have a confirmed reservation on The TranzAlpine train, so you can advise your rental car operator of your reservation when you first pick up your rental car. The TranzAlpine train operates once a day from Christchurch to Greymouth and back to Christchurch. New Zealand Police Officers regularly conduct drink-drive blitzes, often setting up screening checkpoints all around an area, including all lanes of motorways. Being caught drinking and driving will result in being invited to accompany the officer to a police station, or a roadside Booze Bus for an evidential breath test, blood test, or both. Being found with excess breath alcohol, or refusal to undertake testing will result in an arrest, appearance in Court, with a possibility of time in prison, as well as a hefty fine and disqualification from driving in New Zealand. There are NO exceptions. Fixed and mobile speed cameras as well as hand held and car speed detectors are used frequently. Police have no official discretion for speeding offences and will write tickets for all vehicles caught exceeding the speed limit by more than 5 km/h. In some locations, such as near schools, even exceeding the speed limit by only 5km/h will result in a ticket.